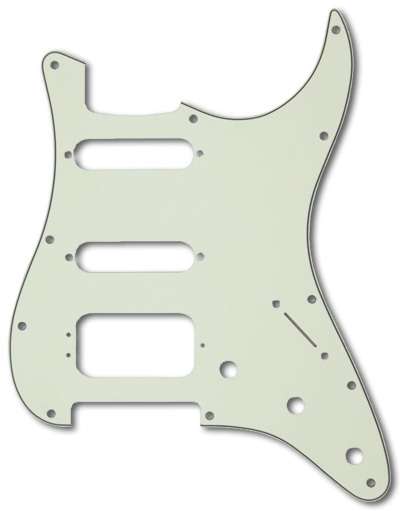 Genuine Fender® Stratocaster® 3 Ply Mint Green HSS Pickguard. Mint / Black / Mint. 11 Hole Standard. One Humbucking pickup and two single coil pickups. The Humbucking pickup mounting holes are the standard Fender® 3 hole style. Will fit American, American Standard, Hot Rod and Deluxe Series Stratocasters (USA). Standard, Deluxe and 70's Stratocasters (Mexico).